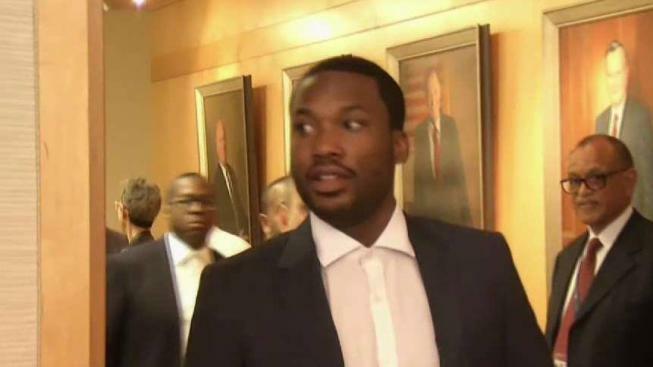 A Pennsylvania judge said Monday she'll rule in "due time" after an evidence hearing to determine whether rapper Meek Mill should get a new trial in his decade-old gun and drug convictions. Mill's attorneys have asked for a new trial based on credibility issues with former Philadelphia police officer Reginald Graham, who was pivotal in his arrest in 2007 and who testified at his trial. The Philadelphia district attorney's office supported the request for a new trial, agreeing before Monday's hearing that the "Commonwealth does not have confidence in the credibility of Reginald Graham's testimony in this case." The attorneys also agreed that another officer who was part of Mill's original arrest had given credible sworn testimony that contradicted Graham's. The district attorney's office also said it had information as early as 2014 related to Graham's misconduct that was not shared with Mill's attorneys until this year. Despite the agreement, Judge Genece Brinkley scheduled an evidence hearing and said Monday she needed more time to review evidence that Graham had credibility issues in this case before ruling whether to allow a new trial. A different Philadelphia judge has agreed to overturn convictions in at least three other cases in which Graham gave testimony, all without evidentiary hearings. The district attorney's office decided not to retry those cases. Mill's attorneys said after the two-hour hearing Monday that the interactions with Brinkley were confrontational. One said Brinkley laughed at testimony from an expert witness, and another said her language during the hearing suggested that she had already decided to rule against Mill's request. The state Supreme Court recently split on a request by Mill's attorneys to remove Brinkley from his case earlier this month. Three justices said they would grant the request to remove his case from Brinkley, while three others said they would deny it or they had not heard enough to grant the request. Brinkley sentenced Mill in November to two to four years in prison for violating probation related to two charges that were dismissed. She found him in technical violation of probation. Mill served almost five months of the sentence before the state Supreme Court ordered his release on bond.